– Local user – A local user is a database user that exists only in a single PDB and has administrative privileges only in that PDB. – Application Common User - An application common user is created in the application root. It can only connect to the application root in which it was created, or to a PDB that is plugged in to this application root, depending on its privileges. It is responsible for activities such as creating, plugging, unplugging, opening, closing, and dropping application PDBs. It can create application common objects in the application root. As it does not have the CREATE SESSION privilege in any container outside its own application container, it cannot access the entire CDB environment and is restricted to its own application container. – CDB Common User – A CDB common user is defined in the CDB root. It may be able to access all PDBs within the CDB, including application roots and their application PDBs. It can connect to any container in the CDB to which it has sufficient privileges. With appropriate privileges, it can perform all tasks that an application common user can perform. It is worth mentioning here that local users in either the regular PDBs or the application PDBs have access only to the PDBs in which the local user resides. Whereas a CDB common user account is created while connected to CDB$ROOT,an application common user account is created in an application root. A CDB common user account is common to all PDBs and application roots in the CDB. An application common user account is common only within this application container. CDB common users may be able to access all PDBs within the CDB, including application roots and their application PDBs. Application common users have access only to the PDBs that belong to the application container and hence cannot access the entire CDB environment like CDB common users. An application common user is restricted to its own application container as it does not have the CREATE SESSION privilege in any container outside its own application container. Only a CDB common user can run an ALTER DATABASE statement that specifies the recovery clauses that apply to the entire CDB. In this article, I will demonstrate access hierarchy and visibility of CDB common users, application common users, and local users in a CDB. Here, we have an Oracle database 12.2.0.1 CDB called orclcdb, as shown below. Within this CDB, besides the CDB Seed PDB pdb$seed, we have a regular PDB orcl and an application container app_root with an application sales_app installed in it. The application container app_root houses one application PDB app_pdb1. - Create a CDB common user c##_cdb_root_user in the CDB root and grant privileges to it. 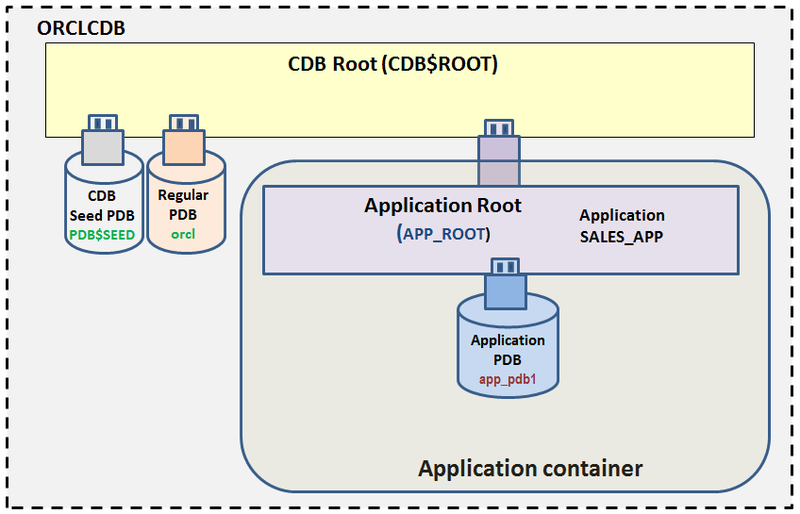 - Verify that the new CDB common user c##_cdb_root_user has been replicated in application root APP_ROOT, regular PDB orcl, and application PDB app_pdb1 and can connect to each of these since it has create session privilege in all the containers. - Check that presently application root APP_ROOT has only one user created common user C##_CDB_ROOT_USER. A value of 'YES' in the COMMON column tells us that user C##_CDB_ROOT_USER is a common object. A value of 'YES' in the INHERITED column tells us that user C##_CDB_ROOT_USER has been created by replication from the parent container CDB root. - If we check the INHERITED column for user C##_CDB_ROOT_USER in CDB root, it shows a value of 'NO', indicating that the user has been created in CDB root itself. - Let us create a common user (outside application action) non_app_user in the application root app_root and grant create session privilege to it in all the containers. - We will now create another common user sales_app_user2 as part of upgrading application sales_app to verify that more than one common application user can be associated with an application. - Now, if we create another application hr_app in app_root and try to associate user sales_app_user1 with hr_app, it fails, thereby telling us that one common application user can be associated with one application only. Let us now create a common application user hr_app_user associated with application hr_app and end installation of application hr_app. - Note that Common users (non_app_user, sales_app_user1, sales_app_user2 and hr_app_user) created in the application root app_root are visible in the application root app_root and a value of 'NO' in the INHERITED column indicates that these users have been created in app_root itself. - Verify that Common users (non_app_user, sales_app_user1, sales_app_user2 and hr_app_user) created in application root app_root are visible in application PDB app_pdb1 after it is synchronized with the applications sales_app and hr_app. A value of 'YES' in the INHERITED column indicates that these users have not been created in app_pdb1 and have been inherited from another container higher up in the hierarchy. - Note that we issued a SQL statement to grant CREATE SESSION privilege to C##_CDB_ROOT_USER, non_app_user, sales_app_user1 and sales_app_user2 in all the containers. However, the CREATE SESSION privilege has been granted to non_app_user in app_root only and not in app_pdb1 because it has been created outside application action. On the other hand, CREATE SESSION privilege has been granted to C##_CDB_ROOT_USER, sales_app_user1 and sales_app_user2 in app_root as well as app_pdb1 . Consequently, whereas C##_CDB_ROOT_USER, sales_app_user1 and sales_app_user2 can connect to app_pdb1, non_app_user cannot connect to app_pdb1. - An application common user created in the application root outside application action cannot connect to any application PDB in that container. - CDB common users and application common users created inside application action(s) can access application PDBs. Let us create local user app_pdb1_user in application PDB app_pdb1 and grant CREATE SESSION privilege to it. - Note that COMMON = NO and INHERITED = NO for app_pdb1_user because it has been created locally in an application PDB. - Verify that app_pdb1_user can connect to app_pdb1 as he has been granted CREATE SESSION privilege. - Verify that app_pdb1_user is not listed in app_root / CDB root and cannot connect to app_root / CDB root. - Let us create another application PDB app_pdb2 in app_root. - Verify that app_pdb1_user is not listed in app_pdb2 and cannot connect to app_pdb2. Hence, a local user in an application PDB exists only in that PDB and has administrative privileges only in that PDB. It cannot access any other application PDB within the same container. Multiple common application users can be associated with one application. One common application user can be associated with one application only. Common users created in application root cannot access the entire CDB environment and are restricted to their own application container. An application common user created in the application root outside application action cannot connect to any application PDB in that container. A local user in an application PDB exists only in that PDB and has administrative privileges only in that PDB. It cannot access any other application PDB within the same container.